We’ve heard these lines and quotes so many times when it comes to our adolescents leaving this world too soon for unbeknownst reasons. If you ask us the major benefit of substance abuse counseling for adolescents in Spartanburg County, we will tell you that our goal is always to save the life of our adolescents. However, at The Forrester Center, we want to take it a step further. While substance abuse can always turn into a life or death matter, we also want to take note of the great quality of life young people have ahead of them. 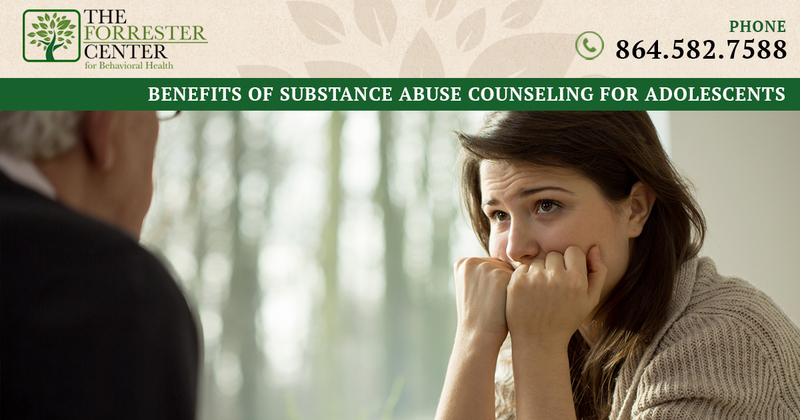 Substance abuse counseling paves the way for a new beginning and that is the greatest of all. No matter how young or old you may be, relapse is always an important and detrimental aspect of recovery. Learning the warning signs, coping with stress and other life pressures, and knowing where your resources are when you feel like you might be slipping are all great benefits to seeking substance abuse counseling. Adolescents tend to find comfort in their routine. Repeating self-destructive behaviors is a habitual thing that can be hard to break. Our counselors utilize a process called Cognitive Behavioral Therapy which helps our clients recognize their negative behaviors and repetitive actions. They then focus on replacing those thoughts and actions with more reasonable exercises and actions. Especially true for adolescents, getting motivated to stop your substance abuse is a great challenge. This can ring true specifically in the beginning of recovery when many adolescents are in denial and do not believe they actually have a problem. At The Forrester Center, we use therapeutic techniques that are encouraging to our clients and help them realize their own motivation to help them recover and seek a healthier lifestyle. It’s no surprise that substance abusers also have their fair share of broken relationships. Rebuilding those connections and having strong relationships will help adolescents feel safe after counseling. It also is a major benefit to the family and loved ones who need that opportunity to speak with the client in a calm setting. At The Forrester Center, we offer substance abuse counseling that seeks opportunities for loved ones to get involved and rebuild their relationship with their child or family member. There are a wide array of benefits to substance abuse counseling for adolescents in Spartanburg County. Don’t let your adolescent go another day without seeking help. For more information about The Forrester Center, give us a call today at 864.582.7588.